Finish off the "Old Town". I use quotation marks because I am not convinced that this is an authentic Old Town. Everything about it says Old Town OTCA, but there is no evidence of a builder's marque, and there is no serial number stamped into the stem. And yet all the details are Old Town. Go figure. 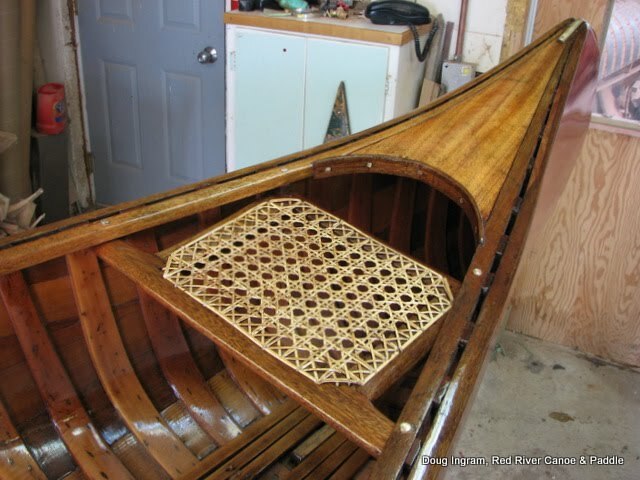 Some years ago the owner's sister had repaired theseats using nylon string and there was some sentimental value to this. Anyway, the owner decided late to have the seats re-caned, this being the thing that would really set off the restoration. 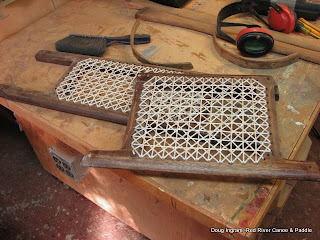 Here are the seats prior to removing the string. 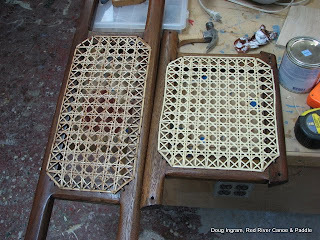 The seats with base coats of varnish and the cane done. 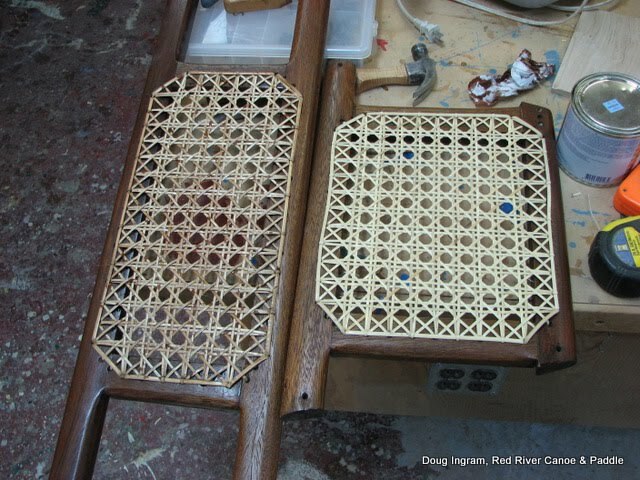 I have applied some stain to the seat on the left, and am just about to do the other seat. New cane on an old canoe makes the seats look too "new" and out of place. A little stain mellows them out. Bow seat and the two thwarts ready to install. You can also see the refinished floor boards. 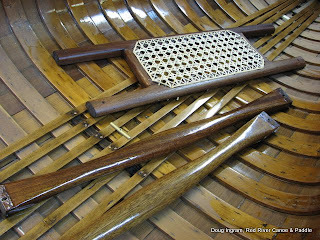 They are just some spruce slats attached to some cross pieces, and held in place by a small piece of brass stem band that is screwed into the hull over the keel. Stern seat installed. These seats were usually installed much higher than current taste would dictate, and its not my call to change it now without the directive to do so. You can see the finish on the trim really brings out the wood grain. 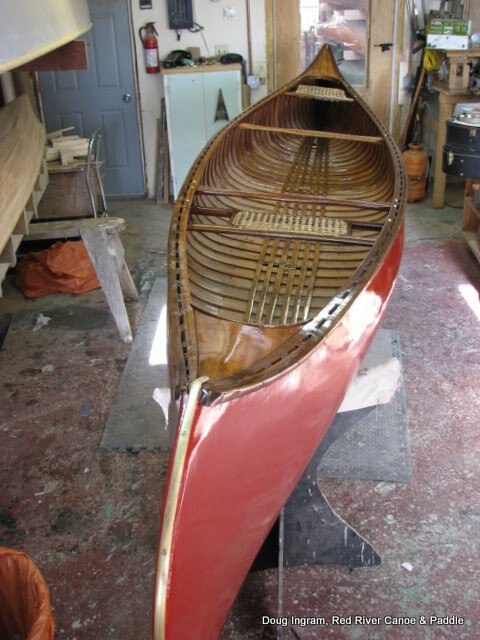 And the finish shot of the canoe all done. Be sure to look at the earlier post that shows the canoe before I started work on it for a before and after look. Posted by Doug Ingram at 8:38 a.m.